There are two different sets of laws in physics: quantum physics, dealing with the very small, and general relativity, dealing with the very large. The trouble is, they both seem incompatible, especially where gravity is concerned. String theory is an attempt to unify the two and, effectively come up with a "Theory of Everything" (TOE). String theory has gone through a few incarnations since its birth in the mid 20th century. It all started in 1968. You may have heard of the Large Hadron Collider, at the CERN institute in Switzerland. There are many such installations throughout the world and, back in the 1960s, frequent experiments were conducted to find a theory to explain how elementary particles, such as hadrons, were scattered in the interactions performed by these facilities. Their initial and final states could be recorded on something called an "s-matrix" and the quest was to find a mathematical formula to explain this matrix. It was physicist Gabriele Veneziano, at CERN, who, in 1968, came up with one, which was termed the "dual resonance model". Unfortunately, the parameters of this model were very limited, meaning that it was either completely correct or completely wrong. It was eventually shown to be the latter. Veneziano's model, however, led directly to the first version of string theory. Hang on - why strings? Let's consider the tiniest, most fundamental particles. They can be thought to exist as a point, with zero dimensions. Thus, when two particles interact, they do so at zero distance. The problem is, at zero distance, Einstein's theory of gravity makes no sense and the equations become all messed up. The only way to make them work is to pretend that gravity doesn't exist. Obviously, this isn't a viable solution, so physicists theorized the existence of one-dimensional "strings", which thus created an element of distance, however small, between particle interactions. Here we see it depicted. The interaction on the left shows the particles as points in space; on the right they are manifestations of a closed string, forming a tube-like structure, thus creating the interaction distance that is needed for the inclusion of gravity to make sense. To continue, this initial theory, unfortunately, had two basic failings. One, it proposed that the Universe consisted only of bosons (an elementary particle). It is known from scientific experiment that there are things called fermions, too. Two, it required one version of the string to possess imaginary mass. To remedy this, scientists had to give the Universe a grand total of 26 dimensions! This seemed to solve the problems, but the whole thing was far from satisfactory. What was needed was a new, improved theory. As has just been stated, all particles in the Universe are either bosons or fermions. In the early 1970s, scientists postulated that each boson was connected in some way to an equivalent fermion in a process that they named "supersymmetry". To date, this hasn't been proved by scientific experiment, so it is still only a theory. However, when supersymmetry was incorporated into string theory, in the mid-1970s, it greatly simplified the equations. Also, such nonsensical things, like infinite values and imaginary energy levels, were eliminated. This new, improved version was therefore called "superstring theory". In subsequent years, there were several different types of this theory: Type I, Type IIA, Type IIB, Types HE and HO (these last two collectively "heterotic" string theories, this mysterious word alluding to closed strings, or loops). He suggested that the five apparently different theories were, in fact, the same theory looked at from different viewpoints. He proposed "M-Theory", which unified all the previous theories. What the "M" stands for in this enigmatic name has never been actually defined, but it is generally thought to refer to the word "membrane". Put very simply, the theory suggests that strings are one-dimensional slices of a two-dimensional membrane. It required the addition of another 11th dimension, in which these membranes were found. This theory also allowed for the existence of the graviton, the gravity particle, which means it may be finally a way of uniting quantum theory with general relativity. M-Theory is currently the prevailing one, until, that is, someone comes up with something better. In the mean time, such luminaries as Michio Kaku and Stephen Hawking have asserted that this theory may lead directly to the elusive "Theory of Everything". All objects, including you and me, are made up of chemical compounds, which are groups of molecules. These molecules are made up of atoms (i.e. the elements found in the Periodic Table) and the atoms themselves contain protons, neutrons and electrons. Continuing to delve more deeply into the inner world of elementary particles, the protons and neutrons are made up of combinations of no more than six different types (or "flavours") of quark. Now, these enigmatic strings are considered to be extremely small, one-dimensional filaments operating on the Planck scale. This is the smallest unit of measurable length, with anything smaller being meaningless. It is many millions of times smaller than an electron. They are said to oscillate and the different levels of oscillation may cause the string to manifest to an observer as an electron, an "up quark", a photon of light, or a graviton. These tiny filaments of energy can exist as both open and closed strings. Any joining together of strings can be thought of as interactions between the particles they manifest as. In our everyday world, we experience three spatial dimensions - height, width, depth - and, since Einstein's laws, a fourth, temporal one (in other words, time). These four dimensions can be used as coordinates to explain the position of an object. In string theory, more coordinates are required to express the position of the strings, for the equations to make sense. Hence the extra dimensions. So, where are they, these extra seven dimensions? 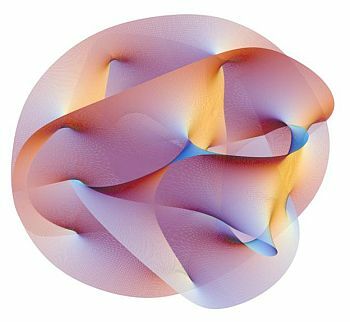 It is called a "Calabi-Yau manifold" and only has within it one kind of force - gravity. The other three fundamental forces of the Universe - electromagnetism, the strong nuclear force and the weak nuclear force - are confined to our familiar four dimensions. Notice how the word "theory" has been banded about a lot on this page? Because that's all what you've just read is - theory. As things stand, we don't have particle accelerators powerful enough to attain the extremely high energies needed to make meaningful experimentation. 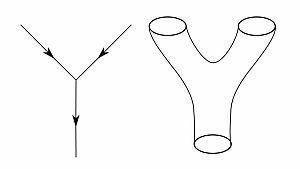 However, as many physicists have said, the M-Theory version of string theory is the best contender, so far, of providing a way to unite all four fundamental forces into one simple, elegant equation. This is the holy grail of physics.